One of the "tricks" that writers use to tackle social issues like racial injustices is switching to a proxy. People can get so wrapped up in their feelings on an issue that addressing it head-on can set them off into their self-prescribed justifications such that they don't actually process anything you're trying to tell them. There was an incident a few weeks ago where a county courthouse hung a "Black Lives Matter" poster drawn by a middle-school student. A retired-NYPD-officer-turned-local-talk-show-host started clamoring for it to get pulled down because he felt it constituted hate speech. There is nothing anti-police about Black Lives Matter, nor was there anything anti-police in the poster. But you can't tell that to this guy because he's so wrapped up in his defensiveness that he's not hearing what anyone in the BLM movement is actually saying. Even though they've expressly and repeatedly said that it's not about hating on police, but demanding equal treatment for people with darker skin. One of the more famous (though not necessarily best) examples of a proxy in fiction is the "Let That Be Your Last Battlefield" episode of the original Star Trek series. 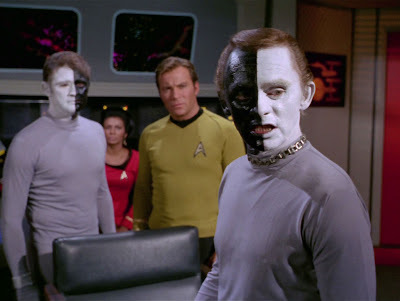 It's still very obviously a discussion and observation on racial disharmony -- a fairly heavy-handed one at that -- but by using utilizing the half-black/half-white characters where most viewers would not immediately notice the deliberate switching sides between the two characters. It uses a not-naturally-occurring characteristic to showcase the absurdity of hatred based on something so superficial that most viewers would miss the difference. M.I.A. 's video for her song "Born Free" similarly utilizes an easily over-looked characteristic (red hair) as a proxy for race. There are similar examples in comics, as well, although they tend to be more immediately obvious analogues for the reader. The Kree in Marvel comics, for instance. Some are Caucasian, some are blue. Or the Inhumans -- there are 'regular' Inhumans and then there are the Alpha Primitives. (Although I think this overall storyline has largely been "resolved.") There are enough significant/obvious visual differences that readers can spot the race dialogue coming a mile away, and the use of proxies becomes moot because any defenses a person might have about race got thrown up immediately. I mean, DC's Tyroc isn't really even an analogy -- no one is going to come to that story without seeing the message right on page 1! That's not to say racial issue proxies can't be done well in comics. But even EC's famous "Judgement Day" is an blatant racial analogue; the story largely works so well because of the "twist" at the end that runs as a counter-point to the obviousness of the robot proxies. Generally, to be effective, the reader can't see the parallel immediately. The message only comes across successfully, I think, when it kind of blind-sides the audience after they've invested themselves in the characters and/or the story as a whole. You can do the whole blue skin/orange skin/purple skin/black skin direct route like Denny O'Neil and Neal Adams famously did, but I suspect the stories that have a greater impact and change more minds are the ones that sneak up on the reader with an unobvious proxy when they aren't expecting it.